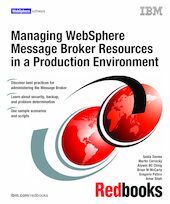 This IBM Redbooks publication provides guidance on how to manage WebSphere Message Broker V6.0 and its resources in a production environment. It begins with an overview of the WebSphere Message Broker V6.0 architecture, components, and features. These components play a key role in the integration of disparate applications and platforms by providing functional and transport capabilities that support and facilitate enterprise-level business integration. The book describes how to manage and to administer WebSphere Message Broker V6.0 appropriately to achieve maximum stability, availability, and performance in a production environment. This book provides extensive guidance and instructions for various administration tasks for the message broker domain, such as, resource management, security, backup and recover, monitor and health check, maintenance strategy, and problem determination. It covers all the main message broker domain components, such as the Configuration Manager, the broker, the User Name Server, and the Message Brokers Toolkit. It also discusses underlying components such as WebSphere MQ queue manager and the database that is required to run the message broker and notes all generic- and platform-specific considerations. Finally, this book includes sample scenarios that demonstrate important tasks that complement the discussions included in this book.